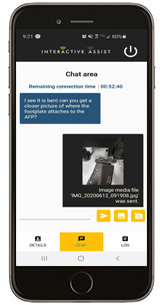 Reduce service visits with Interactive Assist, a new diagnostic app from Quantum Rehab that provides a direct, real-time connection from a power chair’s electronics to a provider’s programming station. 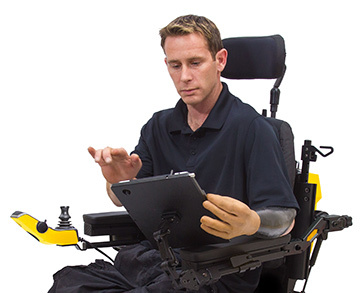 The connection provides the technician with full system and diagnostics information along with tools, such as a real-time mirror image of the power chair’s electronics display, to aid in eliminating wasteful trips. Interactive Assist can be used with the Q-Logic 3 Advanced Drive Control System. Download the app today! Code 14 - "Proportional Input Device Not Connected"
Occurs when a programmed device is missing at startup. Provider can connect via end user and instruct them on how to select the correct proportional input device via AUX menu if another input device exists. Provider can connect via end user, look at the charging history and determine if the end user is undercharging the batteries. If this is the case, they can re-educate the end user on proper charging habits. Code 45 - "Input Device Not Present"
Provider can connect via end user and instruct them on how to select the correct input device via AUX menu if another input device exists. Code 15 - "Drive Motor Encoder Not Connected"
Provider can connect via end user and determine if encoders are enabled. If encoders are not enabled, a technician will need to be sent out to enable the encoders. If encoders are enabled and the fault is occurring, the provider needs to replace motors. Code 23 - “Motor 1 Output Defect"
Provider can connect via end user, view the firmware version and determine if a firmware update is necessary. If the charging habits are good, provider can determine if there is an issue with the batteries, charger, or a wiring harness. Code 43 - “Motor 1 Current Measurement Out of Range"
Provider can connect via end user and determine if a firmware update is necessary. Code 49 - "DMS Fault"
Provider can connect via end user and monitor to see if an input device is out of center without being deflected. If an input device shows out of center, that device needs to be replaced. If an input device is not out of center they can check to see if they have the latest firmware pack. If both input device and firmware check out, a technician will need to be sent out to troubleshoot. Provider can connect via end user and determine if the caster sensors are connected or out of calibration. If they are out of calibration, the provider will need to send a technician on site to recalibrate. If the casters are not being detected, the provider can instruct a caregiver to make sure the caster sensors are firmly connected. ISSUE: Technician/clinician is using a handheld programmer. Consumer says they would like to operate iLevel® through a switch. SOLUTION: Technician/clinician can contact Quantum® Tech Support and have remote ECON connect through dealer-to-dealer access. QTS can perform advanced programming that the handheld cannot perform. ISSUE: Consumer says Sip-n-Puff is hard to operate. SOLUTION: Technician/clinician can contact Quantum® Tech Support and have remote ECON connect with dealer-to-dealer access. QTS can check pressure and make adjustments that on-site technician/clinician may not be familiar and/or comfortable with. NOTE: Advanced programming of ALL drive control devices can be performed with IA. ISSUE: Consumer reports they are in drive lockout. tilt and/or recline angle isn't too great that it would cause a drive lockout. ISSUE: Consumer heard they can control their computer through the input device. Bluetooth® videos and connect the electronics to their computer on their own. ISSUE: Consumer is having trouble navigating the Q-Logic 3 menu. through what they need to do. ISSUE: Consumer reports they are seeing error codes. from there. This issue could be as simple as a loose cable. Technician can direct caregiver to check connections are secure. ISSUE: Consumer heard that Q-Logic 3 can control IR devices. SOLUTION: Provider can connect via end user and build menu trees for IR. 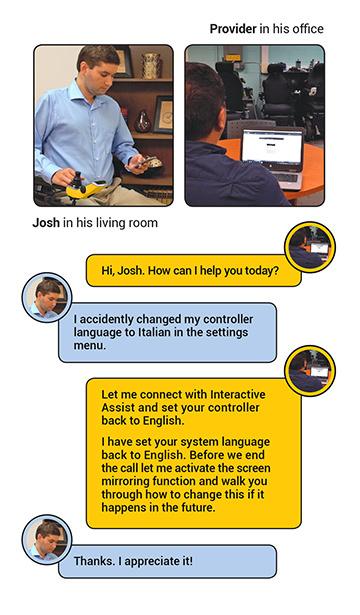 Consumer or caregiver can then use the remote control to set the codes. ISSUE: Consumer has been using Bluetooth®, accessing the clicks through a switch. They want to access the clicks through the joystick. SOLUTION: Provider can connect via end user and update the access method. ISSUE: Consumer reports the chair won't drive. how to engage the motor(s). ISSUE: Consumer reports they are getting an error message intermittently. SOLUTION: Provider can connect via end user to check the fault/ error log. If the issue cannot be resolved remotely the technician knows what equipment is needed to fix the issue or further test the problem. 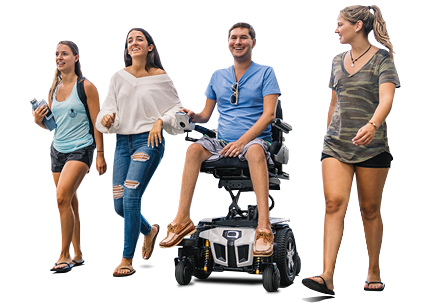 ISSUE: Consumer reports the wheelchair is veering to right or left. SOLUTION: Provider can connect via end user, monitor the system and see if a motor is pulling high current. This allows the technician to bring the correct parts to the consumer's home for a repair. ISSUE: Consumer reports they cannot tilt (or recline) past a certain degree. 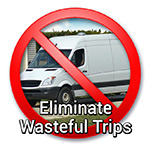 determine if a trip is needed.